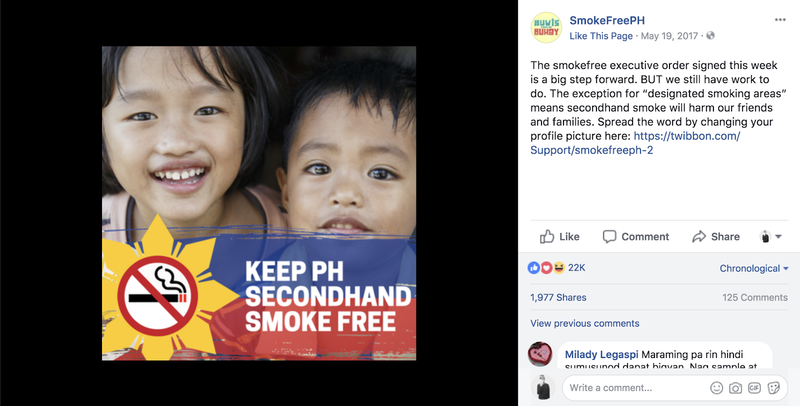 Because of M+R’s decades in the trenches in the fight against tobacco, Vital Strategies asked us to help them with a new kind of health campaign that public health advocates in the Philippines, Indonesia and India were getting off the ground. The health community in these countries was already very good at educating the public about the harmful health effects of tobacco products. For the first time, they are attacking the evils of the tobacco companies head-on. The goal of the effort is to toxify the status and smokescreen of goodwill that tobacco companies enjoy in Southeast Asia where they often support community development and sports teams. We needed to undercut the power of the tobacco industry so that pro-health policies like tobacco taxes and packaging labels proven to lower smoking rates can be put in place. While field organizers were lining up advocates and press coverage on the ground, M+R worked with those advocates to create a social media strategy and content. 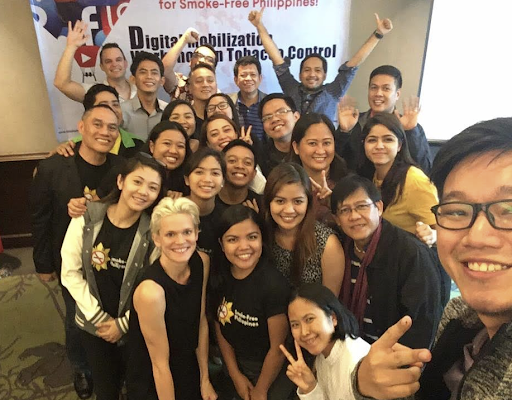 Our role was to equip the advocates with the tools and posts they needed to spread the word about the ills of the tobacco industry using Facebook, which is very popular in the region. We began by traveling to a convening in Manila, Philippines of dozens of health advocates from the three countries. During the sessions, we discussed the campaign’s theory of change, shared our best lessons from running advocacy campaigns on Facebook, and even workshopped the unifying campaign name: #TheyLieWeDie. Throughout our work together, we listened very carefully to the advice of the advocates in the Philippines and India about the political and cultural sensitivities of our messaging and imagery. We also kept a close watch on the data to see how people engaged with posts that were in English versus Tagalog or Hindi. Thousands of Filipinos standing with the campaign signed this Facebook petition letter in opposition to tobacco companies. 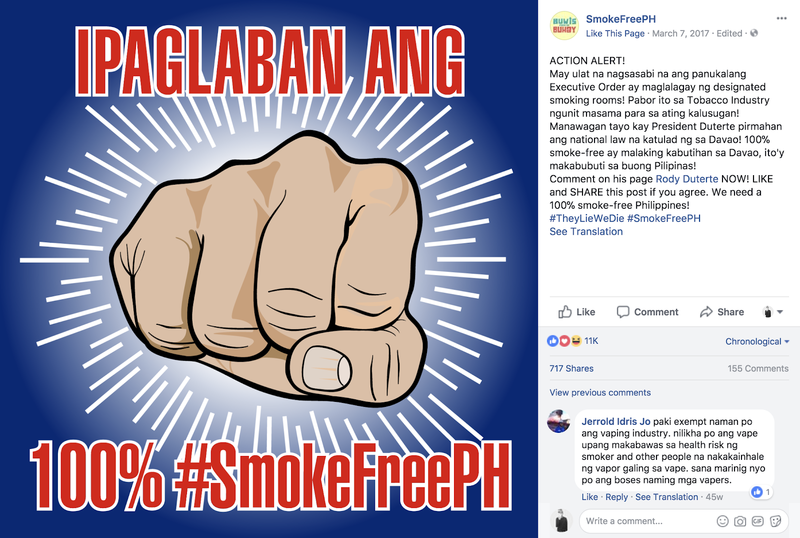 And more than 1,000 people changed their profile picture after the Filipino president signed an Executive Order siding with the public health advocates’ campaign. In the first 6 months, the #TheyLieWeDie campaign’s Facebook content reached over 7,335,000 people and engaged over 606,000 people in the Philippines. For context, 1.7 million people live in Manila. The work to fight back against the tobacco industry is massive and is only beginning. It’s off to a strong start. We’re seeing that it’s possible to use social media overseas to tell the whole story about Big Tobacco’s greed and corruption and weaken their reputation and power at the global negotiating table.